I never did get around to posting all my photos from Albion's ALL-IN Block Party ... and I also haven't been able to spend much time at the fire station lately, So I'll make up for it by combining the two, with a look at the Albion Fire Department's booth at the event (which you may remember happened in late June). I was around the corner with the other authors at the time, but I sneaked away a couple of times to grab some photos. One was this, of the AFD's area--which, as it happened, was on the same block as the location of Albion's first firehouse, built in 1887. 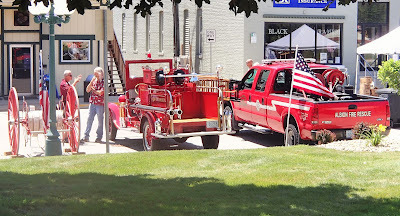 While I was selling books, so were the firefighters: They distributed some copies of Smoky Days and Sleepless Nights: A Century or So With the Albion Fire Department. Of course, proceeds from sales of that book go to the AFD. 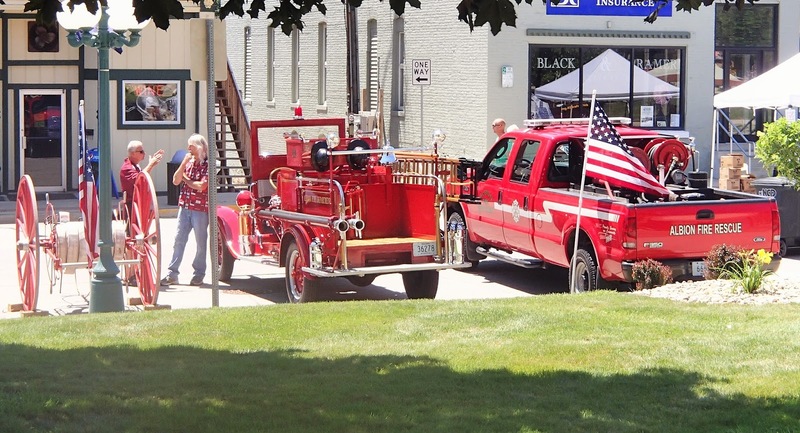 The truck on the right is one of our two four wheel drive brush fire/first responder trucks. Here's a closer look at the hose reel, which you might be surprised to know is no longer an in-service apparatus. As near as my research can tell, this is the third of the AFD's three hose reels, which means it dates to around 1900. 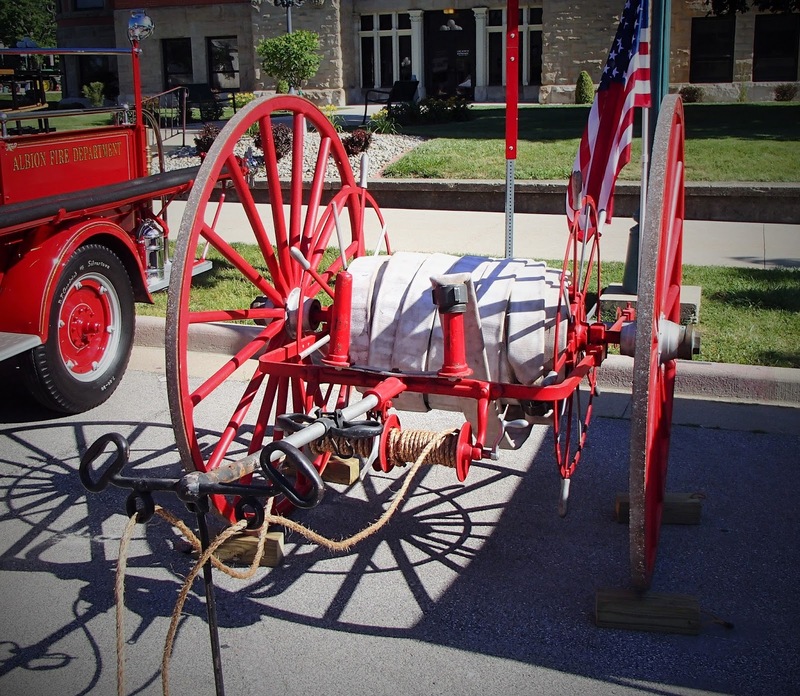 Most of today's fire engines carry a pump, hose, ladder, and water tank. The hose reel carried just hose and nozzles, working in conjunction with the town's hand-pumped fire engine and hook & ladder wagon. Why separate? Because they had to be light: They were pulled to the fire by hand! 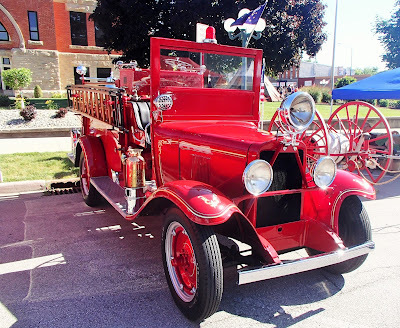 After a hand-pumped engine and then a horse-drawn chemical wagon, this was Albion's first gasoline powered fire engine: a 1929 Buffalo Fire Apparatus Co. truck on a Chevy chassis. It carried 450 feet of hose, along with ladders and hand tools, and a 35 gallon chemical tank that was basically a big pressurized fire extinguisher. Best of all, it could pump an amazing 300 gallons of water per minute, and didn't need a team of firefighters operating a hand pump to do it. You have to wonder why they didn't go ahead and put a roof on it, though. Sunny ... and hot! I've been hotter, though. Old vehicles are so much fun! I love that they have been preserved. Yes, a lot of love has been put into them over the years. To me the fun part was back in the late 80s, when I found out the hose reel was being kept in a garage at Albion's Old Jail Museum--just a few blocks from where I lived. When I asked if I could get a photo of it, the answer was "which one?" It turns out there were two other hose reels up there, which had been forgotten by everyone: One belonged to a neighboring department, and the other was still another of ours. It had *not* been preserved, but was found on someone's property and donated to the museum.